It’s time to put those New Year’s resolutions into action. Eating healthy and getting shape is my yearly struggle, but this year I am totally motivated. I got a Fitbit for Christmas and I’m totally obsessed. It’s not something that was on my wishlist, but I’m so glad I have it now. So now that I am up and moving, it’s so important to me to pull through with healthy meals. I teamed up with Real California Milk to create a healthy savory dish that pairs perfectly with a good ole glass of milk. Here is my Roasted Red Pepper Veggeti. 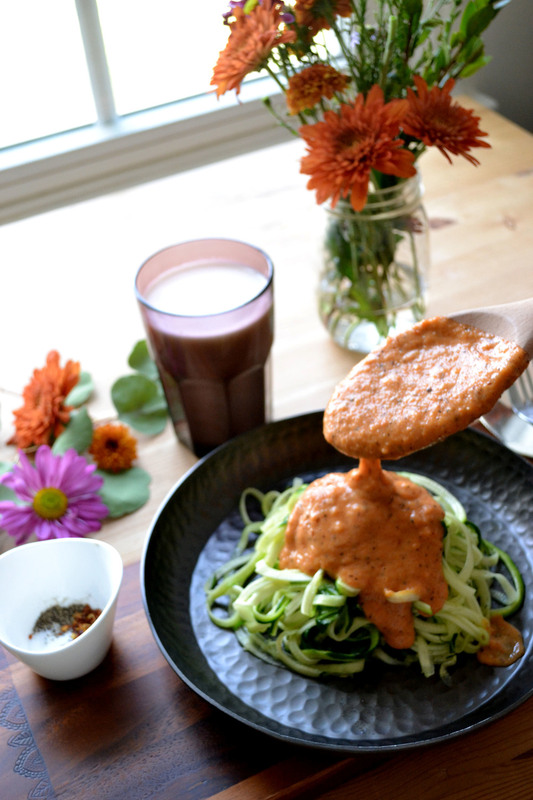 I love the veggie noodle substitute because there is no guilt when going back for seconds and when you have such a tasty sauce you really forget that you’re eating veggies. This dish is low on the carbs and loaded with protein. 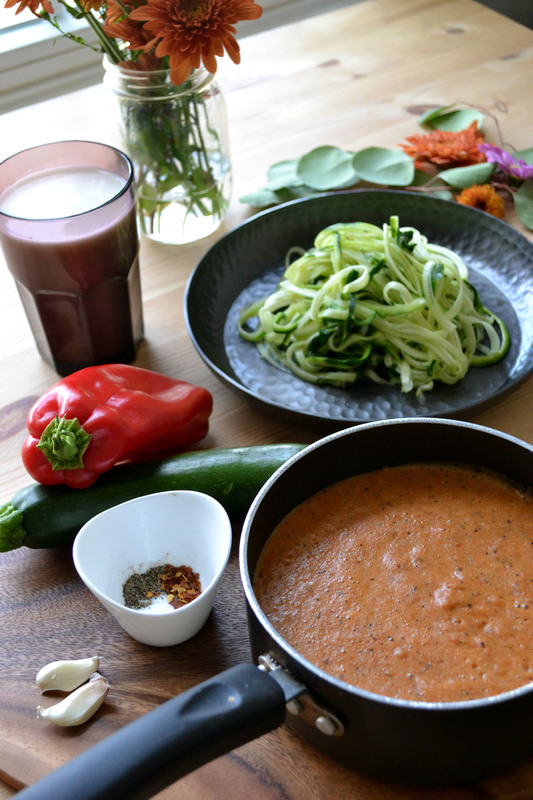 The sauce is creamy with a slight peppery kick, which goes great with milk. I topped it with some grilled chicken, crushed red peppers for a little more spice and some goat cheese to bring out the creaminess. 1. Heat oven to 500 degrees F and roast red peppers on a baking sheet until charred - about 25-30 minutes. Cover in foil for 10 minutes to steam, then remove (peel away) charred skin, seeds and stems. Set aside. 2. Using a spiral vegetable cutter, cut 4 zucchinis and set aside. 3. While the red peppers are roasting, bring a large skillet over medium heat and sautee onion and garlic in 2-3 Tbsp olive oil until golden brown and soft - about 4-5 minutes. Season with a generous pinch of salt and pepper and stir. Remove from heat and set aside. 4. Transfer sautéed shallot and garlic to blender with roasted peppers, milk, red pepper flake, nutritional yeast and cornstarch. Season with desired amount of salt, pepper and red pepper flake. 5. Blend until creamy and smooth, taste and adjust seasonings as needed, adding more salt and pepper or nutritional yeast for flavor. You want the flavor to be pretty robust and strong since the noodles don't have much flavor - so be generous with your seasonings. 6. Once blended, place sauce back in the skillet over medium heat to thicken. Once it reaches a simmer, reduce heat to low and continue simmering. 7. Once sauce is thickened to desired consistency (see photo), add noodles. However, before tossing add a touch more olive oil, salt and pepper to the un-tossed noodles for added flavor. Then, toss to coat. 8. Serve with (generous amounts of) goat cheese, red pepper flake and fresh chopped parsley or basil and grilled chicken.